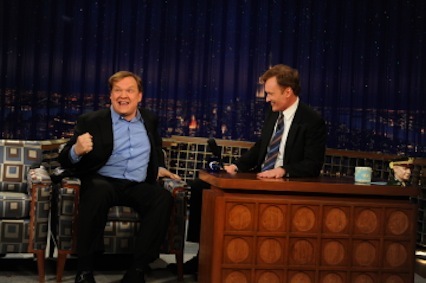 Andy Richter joined Conan O'Brien on his Feb. 20th NY exit show. Giving Conan O'Brien the Tonight Show may not turn out to be such a good idea. We'll see. But re-teaming him with former sidekick Andy Richter seems like a great idea. NBC announced their second coming Tuesday, with the cherubic Richter to serve as the show's announcer while also participating in comedy bits. For the first seven seasons of Late Night with Conan O'Brien, Richter was the host's couch-sitting sidekick. He left in May 2000, and has had sporadic success since in sitcoms and small movie parts. "Andy is one of the funniest people I know and we've maintained a close friendship since he left Late Night," O'Brien said in a statement. "I'm looking forward to working with Andy on a daily basis again, particularly since he owes me $300. Richter joined O'Brien on Feb. 20th for his final Late Night from Manhattan. O'Brien will begin hosting the Tonight Show on June 1st, with Jimmy Fallon succeeding him on March 2nd in the Late Night chair. Current Tonight host Jay Leno will move to prime time in the fall, hosting a new 9 p.m. (central) talk show that will air Monday through Friday. ***The CW has picked up six series for next fall, including one of this season's newcomers, 90210. The other returnees are America's Top Model, Supernatural, Smallville, One Tree Hill and Gossip Girl.